New York, NY The school year is in full swing again, and you and both know what that means, epidemic season! School officials at a local elementary school last Tuesday sent home a notice to parents to beware of a spreading malady, cooties! This outbreak of cooties it the first widespread infection of the season, and may end up being the worst of it�s kind. Recess monitors told reporters that Suzie seems to have originated the infection. From there she spread the contagion to a nearby group of about 15 boys who were playing touch football. The boys in turn spread the illness to girls in the vicinity. �The saddest part about all this is that incidence of widespread infections such as this one are completely preventable. Precautionary measures and education are the best way avoiding these types of occurrences. Ironically, I am the one who should have prevented this,� said the school's health teacher. While there is no known cure for �cooties,� as the disease is commonly called, public health workers are hopeful that the outbreak can be contained. At the same time, however, members of the student body itself may have developed a vaccine for the illness. This vaccine has been at the heart of a fiery conflict about proprietary claims over the �circle, circle, dot, dot� treatment. While most claim that the vaccine falls in the public domain, one young man is trying to assert his intellectual property rights in the matter. �I was the one who came up with the key ingredient of the treatment, that being the rhyme repeated along with the gestures: �Circle, circle, dot, dot, now you have your cooties shot.� Everyone knows I invented the rhyme and everyone knows the treatment is useless without it. They totally stole my idea,� said 9 year-old Brian Acres. 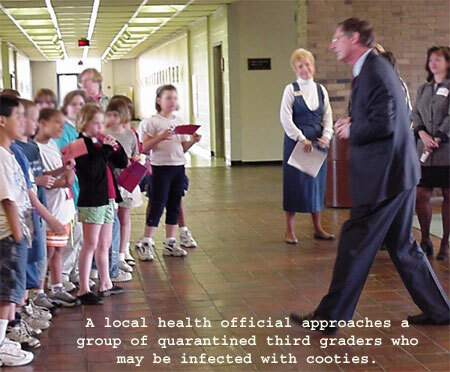 While there is no cure for cooties, it is not fatal. Symptoms include emitting the impression of being �gross� and �icky.� For some reason symptoms are only detectable by members of the opposite gender.